Hello! it’s January 1st, 2017!!!! I would like to thanks everyone who read, liked, and commented my poetries in the last year. 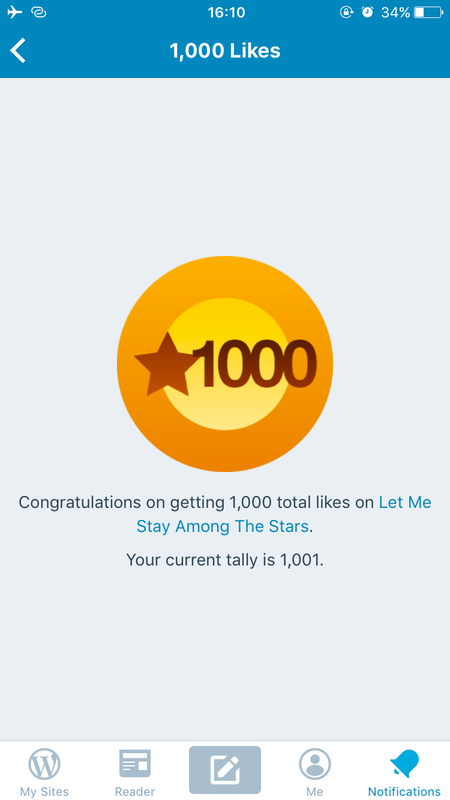 I got the notification of 1000 likes a few days before today. It is a surprising and wonderful gift for me! Thank you so much. I started this blog around March-April 2016. At first, I didn’t really know what to post but I just finished a short course about poetry writing and I really wanted to implement it. I got some likes despite my skill is very newbie which I have to say all of you from that time makes me stay and keep writing more poems. You guys are so encouraging and kind. Shortly, I also found that writing poetry can mend my soul in some way. I feel happier and worthier because I could transform pain, darkness, whatever I had encountered to be something more beautiful. Life is not that bad because I can create something someone read and like and I love them. Something that one does without wanting anything back will return the most valuable things beyond imagination and for me, it is learning and writing poetry. Thank you everyone again! Wishing you all health, happiness, love and everything your heart positively desire.